We begin the Hour 12 report with clarification regarding the demise of the #21 Nissan, which apparently lost a wheel. Tandy continued to lead for Porsche, with the #19 retaining the advantage after two pitstops, and rejoining at 02:30 with a 13 second head start over Lotterer. Bonanomi was 42 seconds further back. Once into his rhythm again Tandy continued to build on the lead, and had eased the advantage out to 63 seconds by 02:50, although the gap back to Lotterer in third had narrowed to just 4 seconds. Hartley, having taken over in the #17, was a full two minutes behind in fourth. Lotterer was closing rapidly on Bonanomi as the race approached the half-way point, but didn’t need to overtake his team-mate when Bonanomi pitted the #9 Audi at five-past three, allowing the #7 through into second without a challenge. Into the twelfth hour and Tandy lead by 65 seconds … and that’s where it stabilised for quite some time. Not so the gaps to those further back, with Hartley in 4th closing on Bonanomi such that the difference narrowed to 70 seconds. Bonanomi was 50 seconds behind Lotterer. Tincknell was back out in the #22 Nissan, and posted some new fastest laps for the car, starting with a 3:38.444 and then following that with a 3:38.196. At quarter-past three, Tandy returned to the pitlane to complete his lengthy stint in the #19, handing over responsibility for the white Porsche 919 to Earl Bamber. André Lotterer inherited the top spot during the pitstop, but only to the tune of five seconds! 45 seconds separated Bamber and Bonanomi in third. Lotterer managed to extend his lead marginally for the first few laps after Tandy’s pitstop, and the gap back to Bamber stretched from five, through eight, to almost ten seconds before the Audi made its own scheduled pitstop at 03:26. 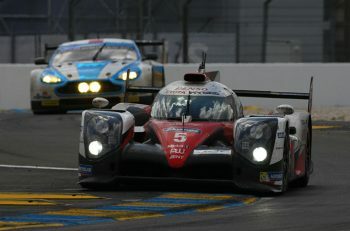 Lotterer clambered out of the car and Tréluyer climbed in, rejoining the race in third. Bamber enjoyed a lead of about 45 seconds at this stage, but it had dipped to 38 seconds on the half-hour, with Tréluyer 30 seconds back on Bonanomi, and Hartley a further two minutes adrift. There was no great change during the next quarter hour, and by 03:45 Bamber could only claim 44 second over Bonanomi, with Tréluyer narrowing his target to 22 seconds. Hartley also had closed significantly, and just 89 seconds now stood between him and the #7. Ten minutes before the end of the thirteenth hour and Bonanomi brought the #9 into the pitlane, where he passed on the baton to Filipe Albuquerque. 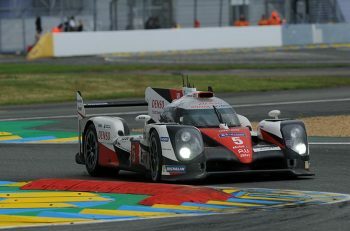 The Portuguese racer emerged just 15 seconds ahead of Hartley. 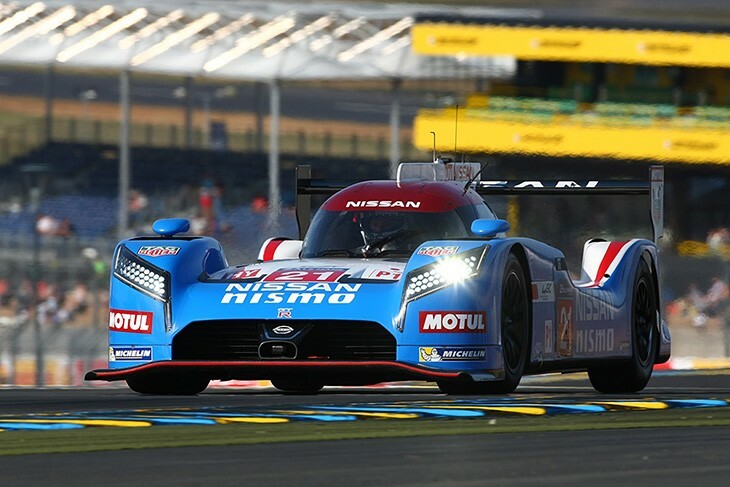 Beginning the twelfth hour, LMP2 had settled down into a fairly steady routine. The #47 KCMG Oreca continued to circulate faultlessly, building up what seemed an unassailable lead, and building on this lap after lap, with consistently quick lappery from all three drivers, typically two or three seconds quicker than the majority of other cars in the P2 field. The exceptions were rare – quick laps here and there from the likes of Sam Bird, Nathanaël Berthon, Nic Minassian and Karun Chandhok. Changes in class order were largely restricted to differing pitstop strategies, and a positioned gained on one pitstop, was then given back at the next. There were a handful of issues, although these rarely affected any of the runners in the top ten. Early into the hour the #29 Pegasus Morgan hit problems, and was responsible for a slow-zone through sectors 28-29-30, but managed to return to the pitlane for attention. More significantly, however, were the issues for the #43, which came to a smoky halt at Indianapolis around half-two and, despite the best efforts of Pierre Ragues, never got going again, and became the eighth official retirement (although not until after four o’clock). There was the smallest hiccup for the #47 when the car pitted five minutes later and stood on the approx for what looked like little more than a visual check for a three minute delay before Lapierre headed back out once more car, his lead cut to just 50 seconds. Narrowly before the end of the hour Minassian pitted the #27 from 9th and Cummings followed him in aboard the #34, with Jonny Kane setting a new fastest lap for the #42 Dome (3:41.781) to pass the pit-bound Cummings and move into 7th. Vanthoor took over from Cummings during the driver change. The race passed the half way mark! Next into the pitlane was Sam Bird in the #26 from third. Farther along the #30 also pitted, and was witness to a fireball that suddenly engulfed the #66 Ferrari. The flames were successfully put out by the crew, but clouds of extinguisher powder billowed out along the length of the pitlane and across the neighbouring track. Others pitting included #42 (Jonny Kane) and #31 ESM Ligier. Seven minutes past the hour and Chandhok completed a driver swap with Nathanael Berthon in the #48 Murphy Prototypes Oreca from fourth. By the time Pierre Thiriet pitted his eponymous Oreca at 03:18, the #46 had fallen back on Lapierre to the tune of 68 seconds. The #28 went for a spin at at Tertre Rouge, but continued. We then had a few minutes of confused amusement, as car #27 was warned twice on the monitors for only having one rear light. That referred to Nic Minassian in the SMP BR01, who was circulating well. The car was then shown the black and orange flag, which is a requirement to pit, but Minassian resolutely stayed out, and pushing strongly. In due course a correction appeared on the screens – not car #27, but the sister car, #37, which duly pitted with only part of one rear light cluster still working. After Thiriet’s pitstop Lapierre established a lead of over two minutes, and at half-past three, pitted the #47 for his next scheduled pitstop. Gonzalez also came in with the #28 from 6th, and next time around it’s the #34, Vanthoor, into the pitlane. At 03:41 we witnessed a new fastest lap for the #48 from Nathanaël Berthon, and his time of 3:39.765 was fastest in P2 at that time by some margin. A little furtherf back a tight duel was building up between Jonny Kane in the #42 and Laurens Vanthoor in the #34 Oak, with the gap down to less than a second. At ten-to four Vanthoor passed Kane for 7th in class. Just before the end of the thirteenth hour Berthon brought the #48 in from 4th for a scheduled stop, and returned to the track just as Mitch Evans brought in the fifth-placed Jota Gibson. Significant is the rise of the #38, to 5th from 7th, and the delay for the #43, which would subsequently retire from the race. The battle between the #99 Aston Martin and the #64 Corvette has been no more than a couple of seconds for a few laps. A slight lapse in concentration from Rees at the first Mulsanne chicane saw him go straight on and just missing the gravel trap. Gavin in the Corvette took full advantage and regained the lead. Next lap however Gavin pitted and handed the lead back to Fernando Rees. Tommy Milner taking the reigns in the Corvette. Over in GTE AM Mathias Lauda who had led for some time relinquished the lead during his scheduled pit stop. #72 SMP inherited the lead with Victor Shayter at the wheel. The #99 Aston pitted and Fernando Rees handed over to Richie Stanaway. Stanaway exited just 4 seconds behind Milner in the Corvette. Soon after Stanaway’s exit there was drama in the pitlane. The JMW Ferrari suddenly lit up by a fuel fire. It appeared to be dealt with quickly but having been put out it re-lit twice hinting at a bigger issue than just a bit of spilt fuel. Stanaway had managed to keep the gap at around 5 seconds but Milner soon settled into a rapid stint. First pulling out a further couple of seconds over a few laps and then producing a 3:56.608 the Corvette’s fastest lap of the race so far. Status quo was maintained in GTE AM when Shaytar pitted to hand the lead back to Mathias Lauda in the #98 Aston Martin. Milner then pitted but had managed to eek out a ten second lead before the stop so handed the lead back to Stanaway but with a greatly reduced margin of 50 seconds. After a 12 minute delay the JMW Ferrari rejoined the party after their earlier fuel fire. It rejoined with Abdulaziz Al Faisal behind the wheel down in 10th in class. Stanaway began turning some quick laps himself trying to build a big enough lead to emerge in the lead even after a stop. Having got to just over a minute ahead Stanaway pitted and did indeed emerge still in the lead by a full 3 seconds.